Congress is currently debating whether to extend throughout the year the payroll tax holiday, which is currently set to expire at the end of February. The original holiday lasted all of 2011 and reduced the employee share of Social Security payroll taxes from 6.2 percent to 4.2 percent. The two-month extension that passed in December reflects the difficultly in agreeing how to pay for a full-year extension. This is because the budgetary cost of a full-year extension is considerable: about $120 billion according to the Joint Committee on Taxation. Proponents of the holiday argue that the economic recovery is fragile, that continued short-term stimulus is in order as a result, and that the payroll tax holiday is particularly effective in this regard because it puts cash in the pockets of those most likely to spend it. While there is a certain appeal to this argument, many economists have a different view of the short-run dynamics of stimulus measures in general and this payroll tax holiday in particular. The long-term growth effects of a payroll tax holiday extension are worth considering as well, as the U.S. appears mired in a long run of slow growth. Here the evidence is quite conclusive: Based on OECD data on 34 member countries between 2000 and 2010, there is no significant relationship between payroll taxes and long-term economic growth. In contrast, corporate income taxes have a highly significant and negative effect on long-term growth. The estimates suggest that cutting the corporate rate by 10 percentage points is associated with an increase in total real GDP growth of 11.1 percentage points over the period. This would move the U.S. from below average to above average in terms of economic growth among OECD countries. Personal income taxes on high incomes also have a significant negative effect on growth, such that cutting the rate by 10 percentage points is associated with an increase in total real GDP growth of 7.5 percentage points over the period. This would bring the U.S. to roughly an average level of growth relative to OECD peers. The U.S. will soon have the highest corporate income tax rate among OECD countries and it already has the most progressive income tax systems of any industrialized nation. Thus, the evidence strongly suggests that the key to boosting long-term economic growth in the U.S. is to cut tax rates on corporate and individual income. Standard economic theory suggests that taxes are a major determinant of long-term growth. Particularly damaging to growth are taxes on saving, investing, entrepreneurship, and high-productivity labor. Other factors affecting growth include education, average per capita income, demographics, size of the economy, rule of law, and regulation. Many economists have attempted to account for all these factors, often with mixed results due to data limitations. However, the following simple correlations of the data in Table 1 show that certain taxes in particular explain a great deal of the variation in long-term economic growth. Table 1 shows cumulative real economic growth in OECD countries over the years 2000 to 2010, where 2010 is the most recent data available from the OECD. This period may be considered the long term in that it exceeds the business cycle, which generally ran from the peak in 2000 to the next peak in 2007 with recessions in 2001 and 2008-2009. Over the entire 11-year period, the U.S. grew 16.7 percent, which was well below the OECD average of 24.9 percent. The fastest-growing country was the Slovak Republic, at 59.7 percent, followed by Korea, Poland, Turkey, and Chile. The slowest-growing country was Italy, at 2.5 percent, followed by Denmark, Portugal, Japan, and Germany. Table 1 also shows various tax rates in OECD countries, averaged over the period 2000 to 2010. The corporate rate is the combined central and sub-central statutory rate. The personal income tax rate is the combined central and sub-central average effective tax rate at four income levels, as defined by the OECD. The Social Security payroll tax rate is the employee plus employer share of Social Security contributions, expressed as a share of wages at four wage levels, again defined by the OECD. Over this period, the U.S. corporate income tax rate was the second-highest in the OECD, at 39.3 percent, which was slightly below Japan's rate of 40 percent, and well above the OECD average of 28.5 percent. Averaged over the period, Ireland had the lowest corporate rate, at 14.5 percent (the current rate is 12.5 percent). Nearly every OECD country, 30 of 34, reduced their corporate rate during this period, with Greece and Ireland reducing theirs by half. Personal income taxes are progressive in every OECD country, meaning the high-income earners pay a higher rate than low-income earners. Some countries are more progressive than others over the income range shown. For instance, Denmark had the highest average personal income tax rate on those making 167 percent of the average wage. Chile had the lowest rate, barely above zero, because of a generous personal exemption that exceeded the average wage. U.S. personal income tax rates were slightly above the OECD average for all four income levels. Social Security payroll taxes, in contrast, are typically regressive or proportional over the income range shown, because they only apply to income up to a certain threshold. In the U.S. in 2010, that threshold was $106,800. This gave the U.S. a slightly regressive rate structure over this income range. Across this income range, U.S. payroll tax rates were well below the OECD average. France and Hungary had the highest payroll tax rates, at around 50 percent, while New Zealand had the lowest at zero percent. Note: GDP growth is cumulative, 2000-2010. Tax rates are averages over the period 2000-2010. The corporate rate is the combined central and sub-central statutory rate. The personal income tax rate is the combined central and sub-central average effective tax rate on various income levels. The social security payroll tax rate is the employee plus employer share of social security contributions, as a share of various wage levels. For a full description of the methodology, see Taxing Wages, OECD, May 11, 2011. Payroll taxes and growth. Our first task is to look at the relationship between payroll taxes and economic growth. 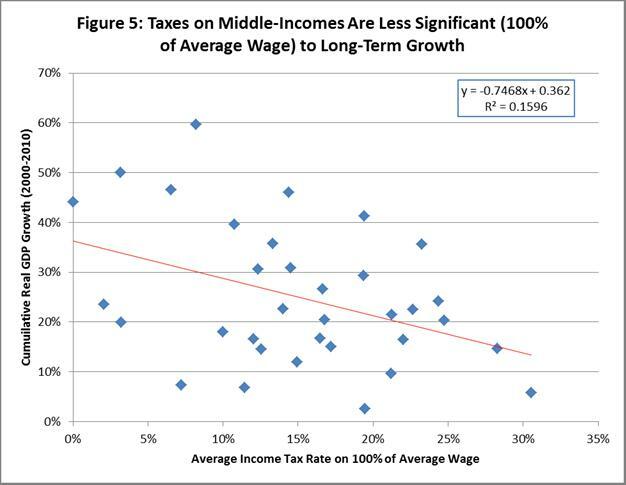 As Figure 1 shows, there is no relationship between payroll taxes and long-term economic growth. 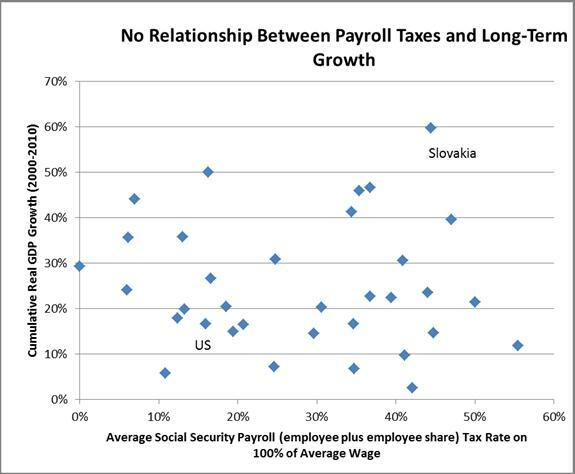 Some countries, such as Slovakia, have high payroll taxes and high growth while other countries, such as the United States, have relatively low payroll taxes and low growth. The OECD provides data on both the employee and employer share of social Security payroll taxes, at four different income levels, and none has any relationship to long-term growth. This is not because payroll taxes are a small source of revenue; they are in fact typically a larger source of revenue than either corporate or personal income taxes. Corporate income taxes and growth. In contrast, Figure 2 shows that corporate income taxes have a highly significant and negative effect on long-term growth. The R2 statistic is 0.243, indicating that 24.3 percent of the variation in long-term growth across OECD countries is determined by corporate income taxes. This very likely makes it the single largest determinant of economic growth. The slope of the fitted line is -1.11, indicating that cutting the corporate rate by 10 percentage points is associated with an increase in cumulative real GDP growth of 11.1 percentage points. The correlation is significant at the 1 percent level. The observations (countries) are more tightly clustered around the fitted line at the high end of corporate tax rates. This indicates that the relationship is more significant when corporate rates are high, as they are in the U.S. For example, the seven countries with the highest corporate tax rates all experience below-average economic growth. However, corporate rates matter at the low end as well, since the seven fastest-growing countries all have below-average corporate rates. Personal income taxes and growth. 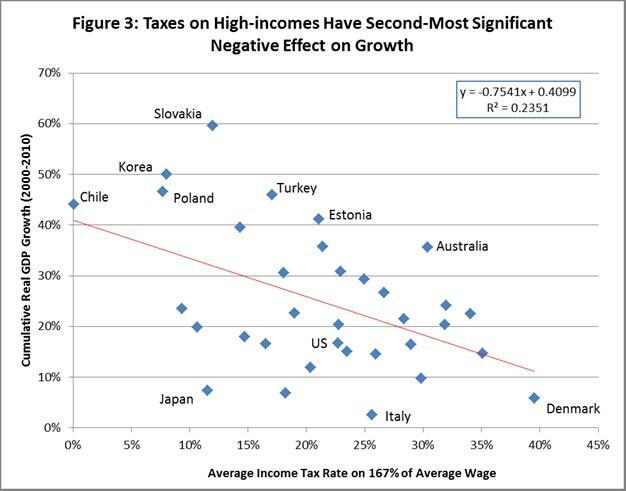 Figure 3 shows that personal income taxes on high incomes (167 percent of the average wage) also have a highly significant and negative effect on long-term growth. The R2 statistic is 0.235, indicating that 23.5 percent of the variation in long-term growth across OECD countries is determined by personal income taxes on high incomes. This very likely makes it the second-largest determinant of economic growth, after corporate taxes. The slope of the fitted line is -0.75, indicating that cutting the personal income tax rate by 10 percentage points is associated with an increase in cumulative real GDP growth of 7.5 percentage points – a large effect but somewhat less than that of the corporate tax. The correlation is significant at the 1 percent level. As with the corporate tax, the seven fastest-growing countries all have below-average tax rates on high incomes. Supporting evidence is offered by the fact that the fastest-growing country, the Slovak Republic, put in a place a flat personal income tax of 19 percent in 2004. Table 1 indicates there remains a degree of progressivity, probably owing to a large personal exemption, but it is much less progressive than the OECD average. 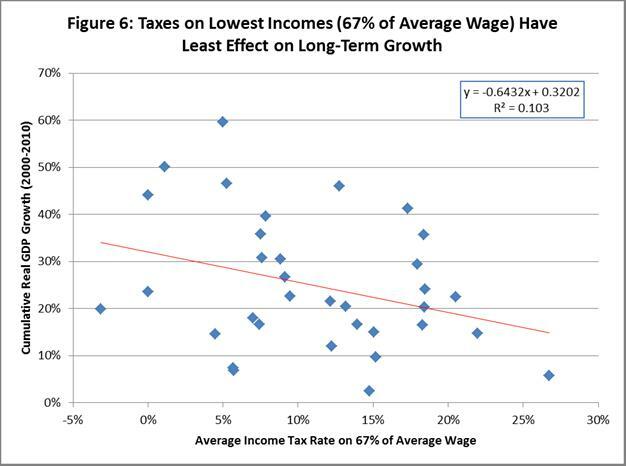 Tax rates on lower incomes have less effect on growth. All of the Bush-era tax laws will expire at the end of 2012 and there are some lawmakers who advocate extending only the tax laws benefiting low- and middle-income taxpayers. However, the evidence suggests that such a policy will have little effect on long-term economic growth. We tested the relationship between the tax rates on three lower income levels – upper-middle-income workers (133 percent of the average wage), middle-income (100 percent of the average wage), and low-income workers (67 percent of the average wage) – and long-term economic growth. The results can be seen in Figures 4, 5, and 6. These charts clearly show that taxes on lower incomes are less significant, and the level of significance declines with each level of income. 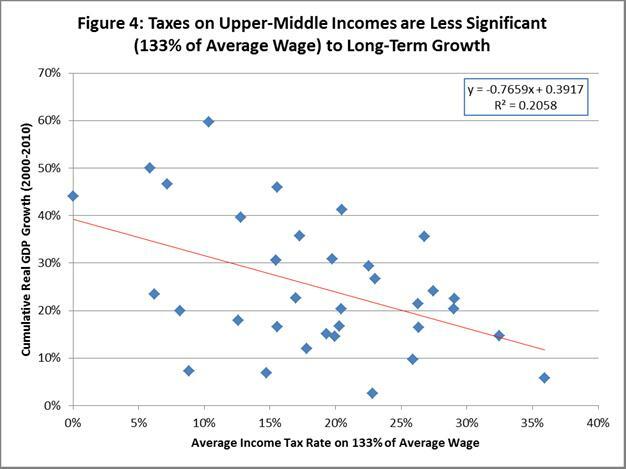 There is no significant relationship between long-term growth and taxes on the lowest level of income. The fact that the ordering lines up with the theoretical prediction makes these results highly robust and unlikely to be driven by spurious factors. That is not to say that the estimated magnitudes may not be somewhat biased by the omitted variables mentioned earlier. For instance, it is likely that having a low per capita income, as all seven of the fastest-growing countries do, is also a major determinant of growth. Having a low per capita income may also be correlated with low corporate and personal income taxes, such that the estimates shown here capture both effects. This is an area for further investigation; however, existing research takes into account such factors and the results are broadly consistent with those presented here. Note: See Table 1 for a description of the data. The correlation is -0.06, with a t-statistic of -0.33, making this correlation insignificant. Note: See Table 1 for a description of the data. The correlation is -0.49, with a t-statistic of -3.20, making this correlation significant at the 1% level. Note: See Table 1 for a description of the data. The correlation is -0.48, with a t-statistic of -3.14, making this correlation significant at the 1% level. Note: See Table 1 for a description of the data. The correlation is -0.45, with a t-statistic of -2.88, making this correlation significant at the 1% level. Note: See Table 1 for a description of the data. The correlation is -0.40, with a t-statistic of -2.46, making this correlation significant at the 5% level. Note: See Table 1 for a description of the data. The correlation is -0.32, with a t-statistic of -1.92, making this correlation insignificant. The political debate over the payroll tax holiday has revolved around possible short-term growth effects, when in fact the bigger issue is a long-run growth slowdown. For instance, since 2000 the U.S. has grown at a rate that is well below the OECD average. Moreover, based on OECD data over this period, Social Security payroll taxes do not appear to have any significant effect on long-term economic growth. This is not because payroll taxes are inconsequential; in most countries they are a larger source of revenue than personal income taxes. 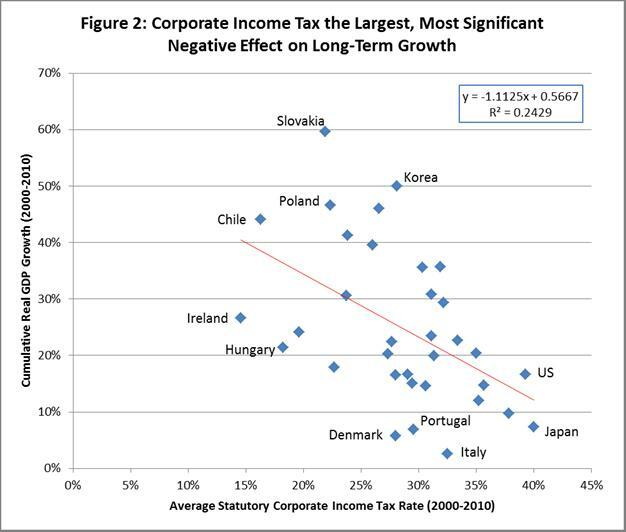 In contrast, corporate income taxes have a highly significant and negative effect on long-term growth. The seven fastest-growing countries in the OECD all have below-average corporate taxes and below-average personal income taxes on high-income earners. The U.S., on the other hand, has the second-highest corporate tax rate in the OECD, and an above-average personal income tax rate. Of the three tax rates considered here, the only one where the U.S. is below average – more than 10 percentage points below average – is the one that does not matter for long-term growth: the payroll tax. If lawmakers want to have the biggest impact on boosting long-term economic growth in the U.S., they should turn their attention to cutting tax rates on corporate and individual income. "Growing Unequal? Income Distribution and Poverty in OECD Countries," Organization for Economic Cooperation and Development, 2008. p. 112. For more on this, see William McBride, "How to Judge a Tax Plan," Tax Foundation Fiscal Fact No. 286. For a full description of the methodology, see Taxing Wages, OECD, May 11, 2011. This indicates the progressivity of the U.S. personal income tax system is about on par with the OECD average, however, this only over a limited income range. More comprehensive measures of progressivity by the OECD indicate the U.S. system is the most progressive in the OECD. See the following: "Growing Unequal? Income Distribution and Poverty in OECD Countries," Organization for Economic Cooperation and Development, 2008. p. 112. Young Lee and Roger Gordon, "Tax Structure and Economic Growth", Journal of Public Economics, 89, 2005. The authors estimate that reducing the corporate rate by 10 percentage points adds 1 to 2 points to annual GDP growth, which is a slightly stronger effect on growth than is found here. Asa Johansson, Christopher Heady, Jens Arnold, Bert Brys and Laura Vartia, "Tax and Economic Growth", OECD Economics Department Working Paper No. 620, July 11, 2008. The authors find that corporate income taxes are most damaging to growth, followed by personal income taxes, consumption and property taxes. Jens Arnold, "Do Tax Structures Affect Economic Growth? Empirical Evidence From a Panel of OECD Countries", OECD Economics Department Working Papers No. 642, October 14, 2008. The author finds that progressivity of personal income taxes negatively affects growth.